This is the audio version of a blog post by the same title. The night before the first Passover seder, or in this case two nights before the seder, because the Passover starts on a Saturday night), it is a traditional Jewish custom to search for chametz (Yiddish pronunciation—chometz.) Chametz is all the stuff you can't eat on Passover, bread being the most famous food in that category. After clearing one's house of the offending foods in advance of Pesach, there is a formal chametz clearing ceremony in which one actually places chametz onto areas one has just cleaned. You then turn out the lights, and by the light of a candle, and with the help of a spoon and feather (some save the lulav palm frond from the Sukkot holiday), the young, or young at heart, sweep up the violating materials that have just been put out. Occassionally I get gas near my kids' school after I drop them off. It's an old gas station that that has not been updated with the latest and greatest. It's one of the only places I know of that still has those vapor-recovery units (an anti-smog device that seemed to fail in its environmental efforts while succeeding in splashing gasoline on customers). Dave Bonta, blogger/poet/naturalist at Via Negativa and Plummer's Hollo, documents the capture of a young golden eagle. His land is right on the path of a regular golden migration route. Scientists were on call, ready for the capture in order to put a transmitter on one of the birds for purposes of study. With awe, reverence, and excitement Dave masterfully documented the happenings in words and photos. She spent four or five minutes trying to straighten her ruffled feathers and get used to the feeling of the harness against her skin and the strange new backpack. Finally, she launched herself into the air, circled low over our heads once, twice, then headed off to the south along the ridge. We were awed and humbled by the experience, and still have a bit of a hard time believing that our far-from-wild ridge twice a year becomes a highway for these archetypal denizens of the northern wilderness. Happy 3rd night of Chanukkah. Blog or Comment - What is a Writer to Do? When you blog, you make yourself vulnerable—almost begging for validation. That validation can come through comments from readers, page views, and ideally a combination of both. I really enjoy commenting on blogs that I like. It feels satisfying to provide the validation that someone has implicitly asked for by writing a blog post. Lately I've noticed that some of my comments are kind of on the long side. Validation, great, but am I being rude, taking up a whole couch in my host's living room? I think what I'm supposed to do is make shorter comments and then take the leftover ideas I have and write a post on my own blog. That post would include a linked reference to the blog that inspired my post. How come nobody ever taught me that in blogging school? Do I have to learn everything on my own? Is there a guide to blogging etiquette anywhere? I don't think that I've made myself unwelcome at any of the blogs that I've been commenting on lately. I think more to the point is that I have a lot to say and I've been frustrated by my inability to write and post pics on my own blog. But hey, it's a new year, no better time to start than now. And it's been three days since I've eaten any junk food. It's going to be a great year! Making my point: "I've got something to say!" 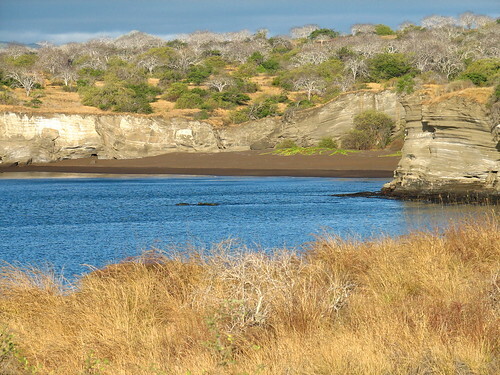 Galapagos Landscape, originally uploaded by Shai G.
Of all the pics I took in the Galapagos when I was there in late June, early July, this might seem an odd choice for the first to post to my blog. Amid the close-ups of marine and land iguanas, turtles, blue-footed boobies, albatross and more, here is a pic with no wildlife present. Nor are there seemingly just-stopped lava flows or water-filled craters or cactus blooming out of a pavement of lava. What grabbed my attention in this pic is the background where the leafless palo-santo trees co-mingle with actual greenery: plants that have the chutzpah to show green leaves in the midst of the dry season. I also like how the telephoto setting on the lens brings all the elements closer together. The foreground where I'm standing, the water, the cliffs and the trees in the back all feel intimate, emphasizing the truth of the interconnectedness of things. I think I might be trying to protect the wildlife by not exposing it, at least for the moment. For me to look at this dry landscape and know that the water and its edges support such a diverse and rich wildlife population is more evocative than "catching" a bird in my lens, who posed as if she were sitting at Sears.